Arrive Beijing, transfer to your hotel. Remainder of the day is free at leisure. Peking Duck Dinner at local restaurant. Visit the vast Temple of Heaven complex (Tiantan Park, a UNESCO site) that was once a sacred area used only by the emperors of China for important ceremonies to honor Heaven, the supreme power. The main structure is the grand Hall of Prayer for Good Harvest, an impressive architectural feat. Today this park is a favorite gathering spot for local residents, a community center where people of all ages come to relax, exercise and express through song and dance. Joining in on activities is a fun way to interact with everyday Beijingers and is welcomed with warm smiles and open arms. Visit the Lama Temple. 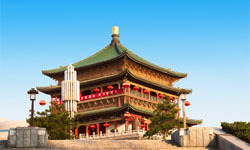 It is the largest Buddhist temple of the Yellow-sect in Beijing and has been completely preserved. Built in 1694 as the residence of Count Yin Zhen, the fourth son of the Emperor Kangxi, it was called "the Palace of Count Yong." After Yin Zhen became the Emperor, he continued to use it as an imperial palace for short stays away from the capital. In 1744, it was converted into a lamasery. Yonghegong is the most renowned Tibetan Buddhist temple in China outside Tibet and holds treasures of both the Han and Tibetan cultures. Beijing Noodle Lunch at a local restaurant. Transfer to airport for flight to Xian. Arrive Xian, transfer to your hotel. Dinner is on your own. Marvel at the important Terracotta Warriors and Horses underground army pits of the 1st Qin Emperor (3rd century BCE, UNESCO site) with your own eyes and understand the magnitude of this portion of the entire mausoleum project. There are thousands of pottery soldiers and each one looks different. Their solemn assignment was to protect the Emperor Qin Shihuangdi in the afterlife. A circle-vision film reenacts the related events of 2300 years ago. Visit the Xian Ceramic and Art Workshop to learn how to make Terra Cotta replica Chinese lunch at local restaurant including the Noodle-making demonstration. Afternoon visit the ancient Shaanxi Provincial Historical Museum, it is considered one of the birth places of Chinese culture, the capital of thirteen dynasties such as Zhou (1046 BC-256 BC), Han (202 BC-220) and Tang (618-907), and has its own unique history and cultural features. The Shaanxi History Museum in Xian, regarded as “the pearl of ancient dynasties and house of Chinese treasures”, gives a miniature overview of the thousands of years of Chinese history and the splendid ancient cultures of olden times. Dumpling Dinner followed by Tang Dynasty Show. Morning visit the Big Wild Goose Pagoda - regarded by many as a symbol of the city, the pagoda was built in 652 A.D in Tang Dynasty to house the sutras brought back from India by the famous monk Xuan-zang. Visit the Ancient City Wall, built during the 14th century on Tang Dynasty foundations, date to the Ming Dynasty; the walls are the largest and best-preserved ancient fortress in the world. Lunch at local restaurant. Transfer to airport for flight flying to Shanghai. 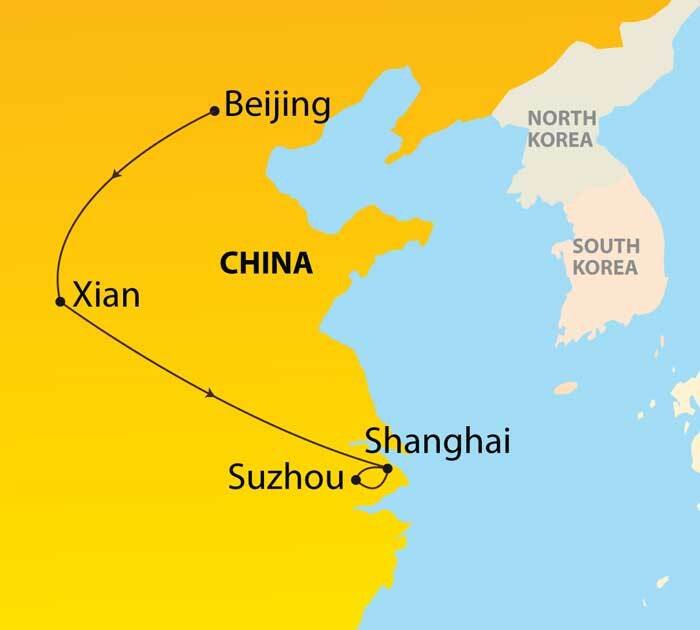 Arrive Shanghai, transfer to Sunrise on the Bund (local 5*). Dinner is on your own. Arrive Suzhou, visit the Garden of the Master of Fishing Nets and Suzhou No. 1 Silk Spinning Factory. The Garden of the Master of Fishing Nets is recognized with other classical Suzhou gardens as a UNESCO World Heritage Site. The garden demonstrates Chinese garden designers' adept skills for synthesizing art, nature, and architecture to create unique metaphysical masterpieces. The Master of the Nets is particularly regarded among garden connoisseurs for its mastering the techniques of relative dimension, contrast, foil, sequence and depth, and borrowed scenery. Afternoon, enjoy the Grand Canal Cruise and Old Town. The Suzhou section of the Grand Canal is the part of the world-famous Beijing-Hangzhou Grand Canal. It is an ancient grandeur project in the Eastern Plains. It is the earliest and longest manmade watercourse in the world. With an overall length of 1794 kilometers, the ancient Grand Canal started in Beijing in the north and reached Hangzhou in the south, flowing through 4 provinces and 2 cities. In the long history, the Grand Canal has made enormous contribution to the communication between North China and South China in both economy and culture. Chinese lunch at local restaurant. Dinner is your on own.